There’s been a bit of a summer lull so I’ve focused less on hunting and more on putting things up on eBay. Over the last few days I’ve listed 18 items, bringing my total to a record 89. A few months ago I had only 25-35 listings. This is evidence of improved organizational skills but also a commitment to eBay as an essential part of my business plan. While eBay sales are slow in the summer I anticipate that this strategy will pay dividends in the long haul, especially around holiday season. I hope to crack 100 total listings by next weekend. It’s funny to think that some of this stuff has just been sitting around in my room, occasionally for years. 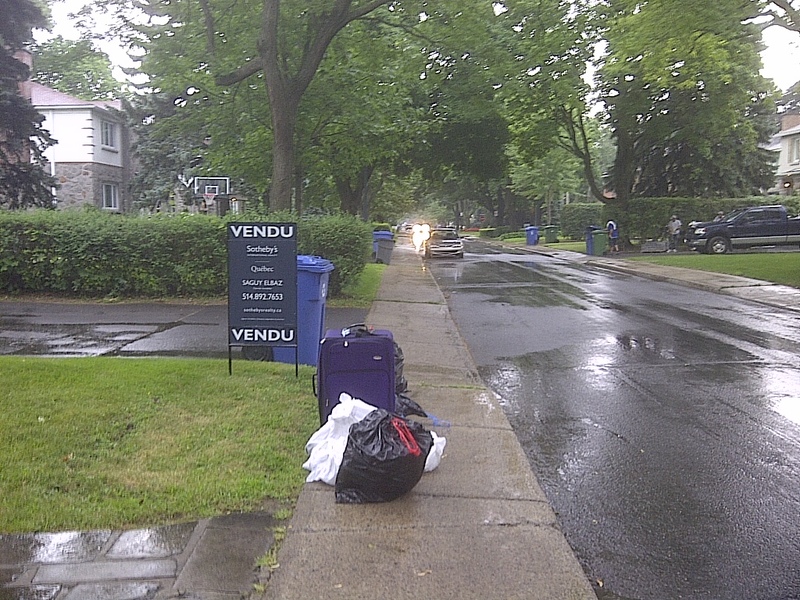 This weeks most notable finds came Wednesday morning in Mount Royal. I left earlier than usual to beat a thunderstorm that was set to move in around 10am. 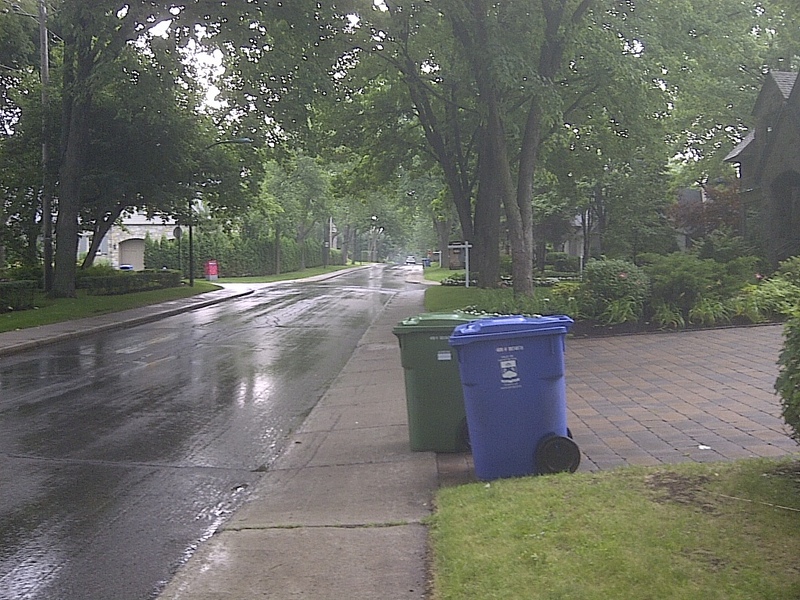 I still got rained on but it was fairly pleasant and I got home in time to beat the worst of it. The pile above looked to belong to a young family preparing for a move. 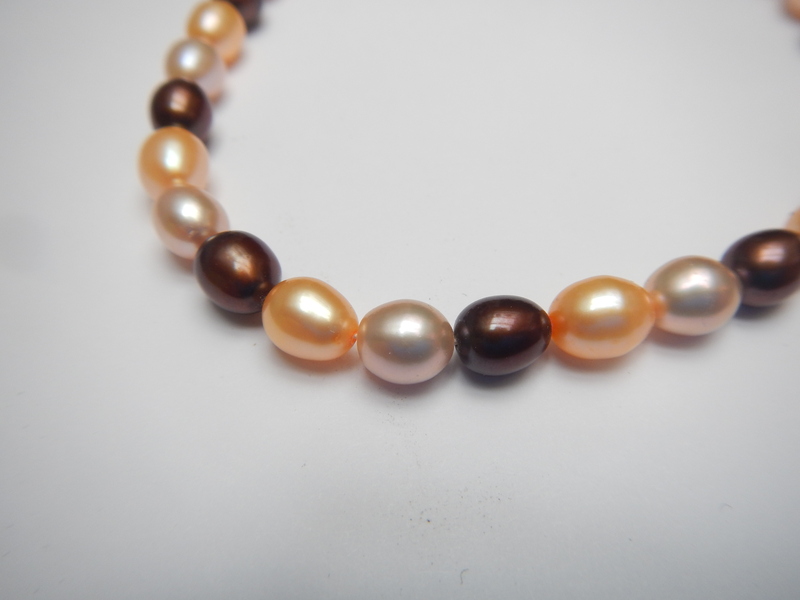 I found a few jewellery pieces in one of the bags, the nicest of which looks to be a real pearl necklace on a sterling chain. The Monet-brand gold necklace is also good and should eventually make its way to my Etsy store (which I hope to get up and running again before October). Outside of the jewellery I found a brand new, wrapped in plastic canvas and a pair of boxing gloves. The gloves are in excellent, barely used condition and sell for around 75$ new. I should be able to get 25$ for them on Ebay. Another house not far away gave off a similar feel. Inside one bag was a collection of wires and consumer electronics. One of the items was a mostly functional Blackberry Bold. The trackball doesn’t work to go down which is a minor but very annoying issue. I grouped this phone with a few other “for parts, repair” Blackberrys and created an Ebay lot. 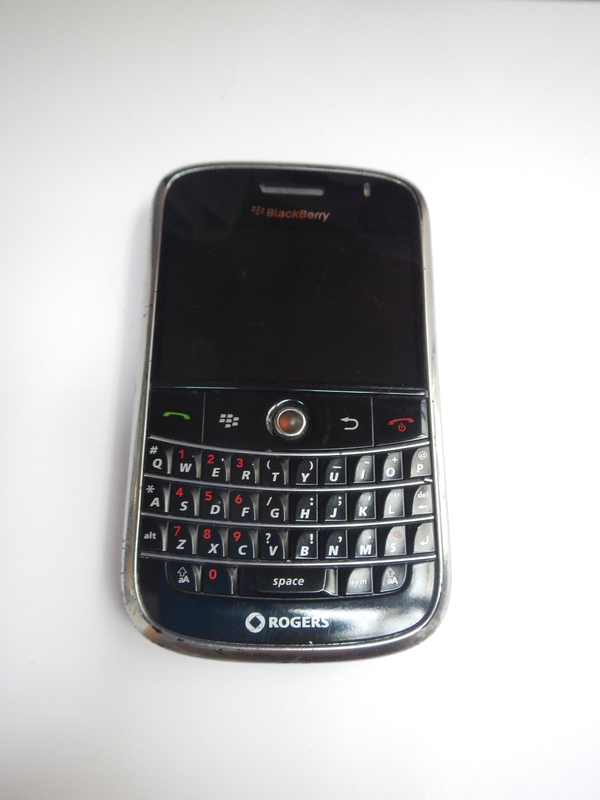 A Blackberry in this condition usually sells for between 15-20$. I can get a bit obsessive trying to recycle cell phones. They contain a lot of valuable reusable metals, many of which are quite toxic when thrown to the landfill. In particular, Coltan is a rare metal used in cell phone production found mostly in the jungles in Africa. Its extraction destroys a lot of pristine animal habitats so it’s important to reuse what we’ve already mined. I’d guess that I’ve recycled or sold around 25 cell phones since I started doing this full-time last year. This website is a good resource for finding a place to recycle your old broken phone – it gave me 10 locations within only two kilometers! I know Future Shop also acts as a drop off location for all kinds of different electronics. Also inside the bag: a working Skycaddie SG5, a golf GPS worth around 30$; two battery chargers full of functioning AA batteries; a bag full of decent golf balls; and a few sports baubles. 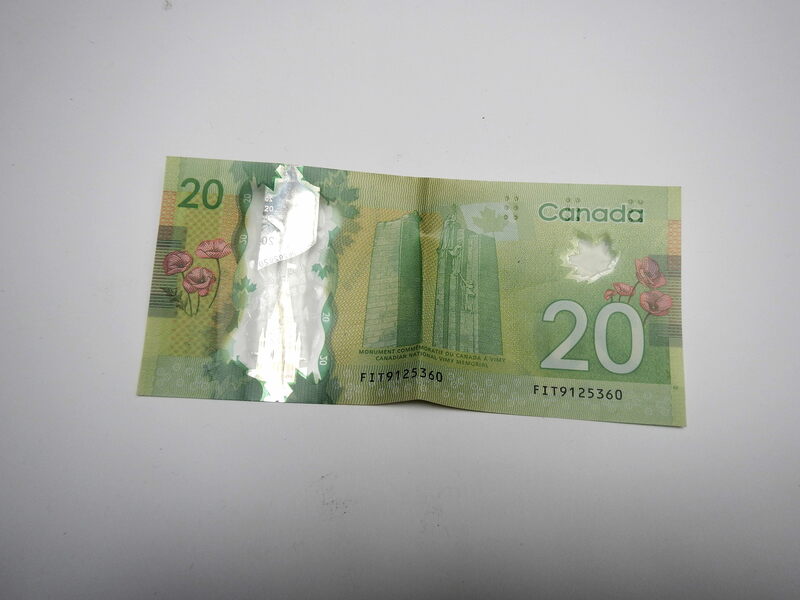 There wasn’t much else the rest of the week, though I did find a 20$ bill while on a run through the Plateau on Friday. No one was around so finders keepers! –Vintage Old Spice Cologne: on Ebay for 37$ (50 with free shipping). I’ve had this for around a year, though I only listed it maybe a month or so ago. I’m glad to see it go! –Joan Sutherland signed program: on Ebay for 17$. Found back in March in Mount Royal. -Euro trade in: 5$. A friend of mine is moving to Spain so I decided to give him all the random Euro coins I’ve picked up. I didn’t ask for anything but he gave me 5$. -20$ bill. I count this as an incidental benefit of working patrolling the streets. Total: 79$, 2149$ since May 18. A poor total but better than nothing. Hopefully the new listings will lead to more sales. I’ve been watching your ebay listings grow. I continue to be amazed by the variety and quality of the things people throw out. It’s great that you do what it is you do. Consider the $20 a much-deserved tip for all your continued hard work. I only dream of rain!! It has been a hot dry summer!!! You need to go over to You Tube and watch the trash pick’n of “momtheebayer” she is INSANE…she finds the most amazing things!! Happy Hunting! Martin,I love your blog and your tips about frugality.I admire scavengers like you .Thank you for your tip about recycling old cellphones. (I did not know that).I live in the Plateau and will be moving away from the Plateau becoz I just broke up with my girlfriend.I am looking for my own apartment or a very big room,probably outside the Plateau.I just want to mention to you that Craigslist is often horrible when it comes to searching apartments at reasonable rents.Rents of apartment listings are often 40% higher at Craigslist than at Kijiji.Beware of this.Ask tenants to ignore crazy rents advertised on Craigslist.I only realized this truth now.Since 2010 I was living in the same apartment in the Plateau until now.